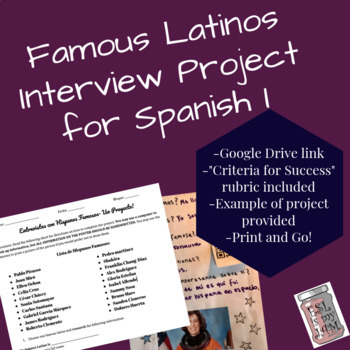 This is a project designed for the first few weeks of Spanish 1 or exploratory Spanish. Works great as a sub plan as well! 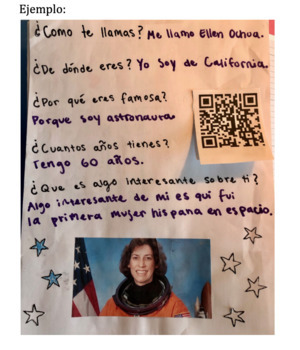 Students choose a famous latino for the list, do some basic research and create a poster with an "interview" with this famous person. Next students record the interview in an audio file. Last, the class listens to all the interviews in a gallery walk style. **Note: After purchasing you will download a word document with a link to the Google Doc. Simply click the link to open the product. Next you will need to create a copy for the document for your own Google Drive and that will also give you the ability to edit the product.